Spring is here at last. I don't know about you but it seems a lot longer than thirteen weeks since the winter solstice. One thing about spring is that life is so abundant that you don't have to go far to look for it. Come with me into the olive grove next door and I'll show you. Absolutely bursting with blooms: Poppies, Pimpernels, Mallow and Medicago, Shepherd's Needles and Vetch. I can see at least fourteen different flowers from here but the one I'm particularly interested in today is the ubiquitous Garland Daisy as they really attract the insects. 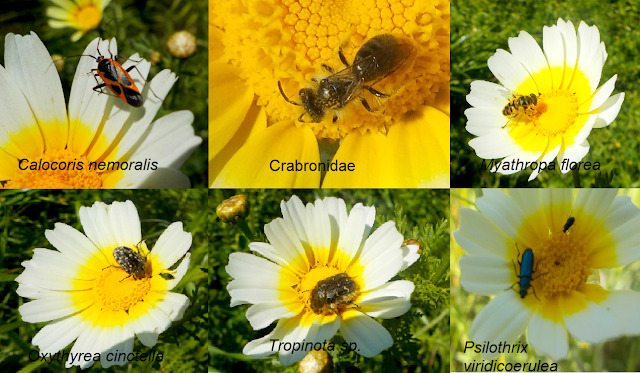 Look, we've got a Mirid Bug, a little black Crabronid wasp, a hoverfly and three different beetles. Not a bad little haul. The sun is shining and there's hardly a breath of wind. Drop everything, cancel all plans, we're going out! With all the rain we've had recently (and more forecast in the coming days) good walking weather is at a premium. A morning stroll by the Myrtos river followed by a spot of lunch in the town is definitely in order. The birds are certainly enjoying themselves. Apart from a murder of hooded crows mustering in that gum tree over there, discussing goodness knows what, I can hear the descending trills of chaffinches, a twittering of goldfinches, the long, drawn out 'dzeee' of a greenfinch and the sharp 'tak-tak' of a male stonechat. And sitting pretty as a picture on that bush to our left is a female stonechat cocking an ear to the male whilst keeping a beady eye on us.